One item that is seldom in short supply at the thrift shops in my town are frames, so it's no wonder that I use frames in my projects very frequently. Here I purchased a $2 frame and painted the frame with Annie Sloan Chalk Paint in French Linen. Then I painted the stiff cardboard back with Ash from Fushion Mineral Paint. I then glued my Scrabble tiles on in a Christmas tree shape with ProBond glue. The glue dries clear but does shine a bit so I touched up with a small paint brush and more Ash paint where glue had oozed out from under the tiles. The star is a wood applique from Hobby Lobby. This framed button tree is a project from 2012. This project has been pinned many, many times. I made this postage stamp tree in 2014. These projects are easy. I like the black background with the scrabble tiles, and it appears to be nighttime. This frame is not a standard photo frame size. The frame opening is 4 1/2" x 6 1/2" so you could use a 5" x 7" frame to make this project. Borrowing Susan Homeroad's Jenga/Scrabble Christmas tree ornament idea, I made several scrabble tile and jenga game ornaments last week. Instead of using wire like Susan, I screwed a couple of eye screws into the jenga tile and tied on red gingham ribbon for a more traditional Christmas vibe. The scrabble tiles were added with a hot glue gun. I then clipped a plastic snowflake on the ribbon with a small clothespin. These vertical jenga tiles have red plaid ribbon. I also used jute twine on some of the ornaments. This one has an upcycled moose clothespin ornament I made last year added to the twine. Thanks for posting! I am so doing this. I just picked up a scrabble game the other day. I was going to do 'give thanks' first, but we are not having company for Thanksgiving so I am moving right on the Christmas. II have done some button arr so have a frame already. Eek! I love it Carlene! After all, what's not to like about Scrabble letters and Christmas. Such a cute tree. (I like the ornaments too). Love your framed Scrabble tile Christmas tree...LOVE them all! Love the Scrabble tile tree, Carlene! Last year, I cut up wood scrabble trays and made each of my grandchildren their names with miscellaneous game letter tiles....turned out so cute! Love the Holy Night! I hope to remember it so I can make one for myself! Always appreciate it when you share your great ideas! Carlene, I've received your e-mails for some time now. I've never commented, but always enjoy your posts and am always inspired. Unlike you, I shop for items and never seem to have time to make anything of them. Time to get busy, right? 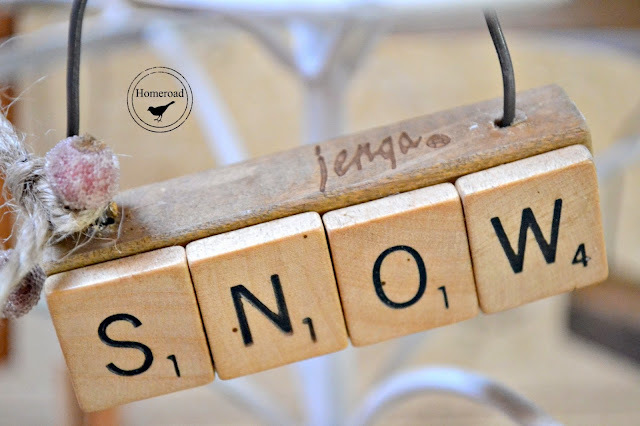 These are all super cute ideas for Christmas decorations, especially the Scrabble letters. I always find that these get lost and then I end up throwing out the left over letters. Now, I may be more inclined to use them. Love pinning a project that I might actually make! Thanks for sharing!